Author J.E. 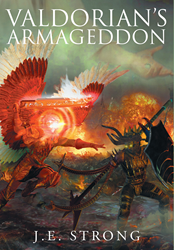 Strong’s newly released “Valdorian's Armageddon” unleashes a Holy War onto a universe, which must be prepared to accept the Truth. “Valdorian's Armageddon” from Christian Faith Publishing author J.E. Strong is an action-backed Christian thriller that brings Holy War to the universe. Only if Leoj and Hope can unite the universe can they save the cosmos. “Valdorian's Armageddon”: the Holy War has arrived. “Valdorian's Armageddon” is the creation of published author, J.E. Strong. J. E. Strong holds his BA in speech-language pathology. He lives in California and enjoys the outdoors, war gaming, weightlifting, sign language, and writing, but, most importantly, he loves his family and God more than anything in the world. Growing up in a deeply Christian and fantasy-loving family, J. E. Strong was familiar with biblical history as well as fantasy folklore. When he began to find Christian parallels in his fantasy books, he saw a potential mode to bring the essence of his beliefs to a broader audience. Published by Christian Faith Publishing, J.E. Strong’s new book brings spiritual warfare to the Prime Medial Universe. Nimdar and Lucilur join forces to exact revenge on the Angelur and Lumilur. As the pair press into the Prime Medial Universe, Leoj and Hope must unite the universe in an effort to stop Hell and the Void from engulfing all worlds with the weight of the cosmos, and parenthood, on their shoulders. Spiritual warfare could not be more real nor more of a threat to the Righteous. Everyone on Valdorian must now make the choice to accept the Truth and defend all that is Holy or cast aside their morals and values out of fear. Armageddon has come to the universe at last. View a synopsis of “Valdorian's Armageddon” on YouTube. Consumers can purchase “Valdorian's Armageddon” at traditional brick & mortar bookstores, or online at Amazon.com, Apple iTunes store, Kobo or Barnes and Noble. For additional information or inquiries about “Valdorian's Armageddon”, contact the Christian Faith Publishing media department at 866-554-0919.